Hi Friends! This first thing on my 'to-do-list' this morning was to make thank you cards for my customers. Because I needed quite a few I knew my cards were going to have be quick and easy, especially as I want to get them out in today's mail! I decided to use the "Happiness Surrounds" stamp set, as it's only available until the end of this month (or while supplies last). This is really a sweet set! Next, I chose the colour of my card base - Poppy Parade - and an accent colour for the layer - Blushing Bride. Not wanting my cards to look too 'Christmas-y' I decided to go with Lemon-Lime Twist for the leaves, instead of my go-to green, Old Olive. In less than an hour I had 16 cards made! The key to mass producing cards is to have everything pre-cut and ready to assemble. I scored all the Poppy Parade card stock at 4 1/4" (down the middle, along the 8 1/2" side) and then cut them all at the 5 1/2" mark (this gives you two cards per 8 1/2" x 11" piece of card stock). Once my card bases were done, I cut my Blushing Bride card stock into 4 1/4" x 3 1/4" pieces and glued onto the card fronts. 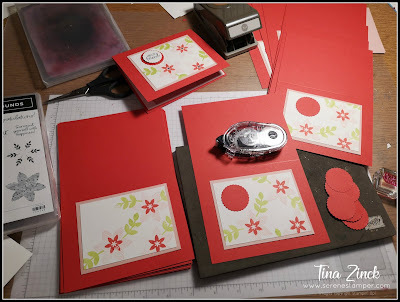 Next, I cut the Whisper White into 4" x 3" pieces and stamped all the Blushing Bride flowers, then the Poppy Parade flower and lastly, the Lemon Lime Twist leaves and glued to the centre. 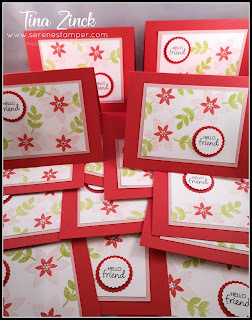 Grabbing some more Poppy Parade card stock, I punched out all my 1 3/8" scallop circles and glued to the cards. To finish the cards, I stamped my sentiment, punched with 1 1/8" scallop circles, adhered with dimensionals and placed a rhinestone inside each flower! I should also mention that I stamped all the envelopes to match too! Now that I've got my thank you cards made I'm going to make a coffee and start writing my personal messages inside and then head on up to the post office! 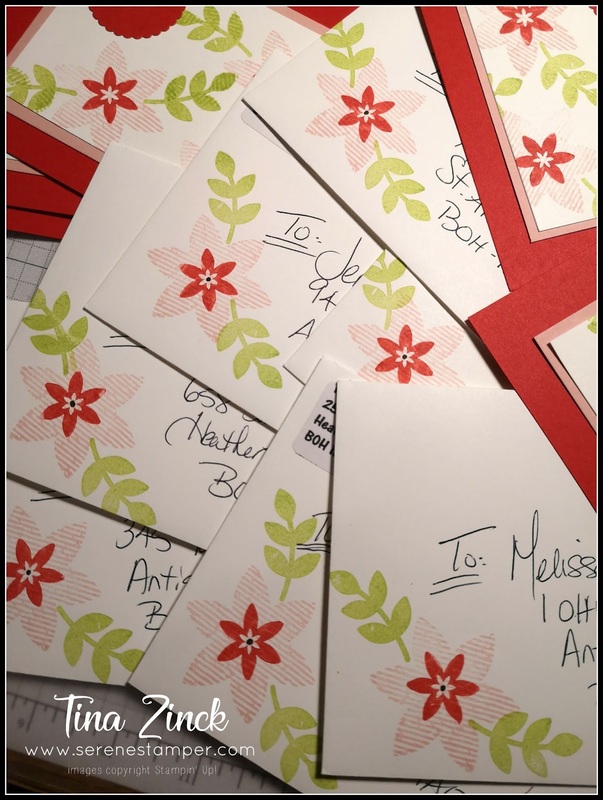 I hope these cards put a smile on the faces of all those receiving them - getting a card is like a hug in the mail, right?! Have a great day!